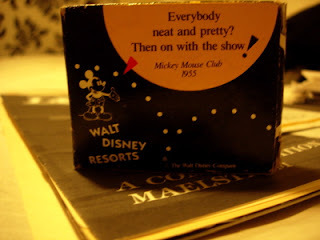 This is a box of Facial Soap from the Walt Disiney Resorts, circa 2004. 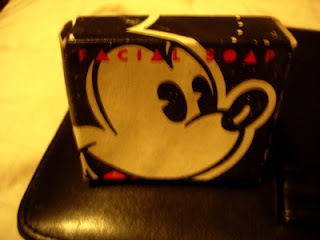 I got this when I stayed at a Walt Disney World Resort in Florida (the soap that they give you now is different, and the packaging is not as cute). 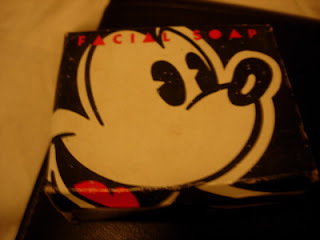 When you stayed at one of the Resort Hotels, you also got some Bath Soap, Shampoo, Conditioner and Lotion, all with the same Mickey Mouse design. Of course, while you were on vacation, you never wanted to use all that stuff- so you saved it and brought it home....and maybe used it later.